Polyurethane Sandwich Panels are manufactured at our factory for constructing Walk-in-Chillers and Freezers in standard sizes, with internal volumes ranging from 4000 liters to 20000 liters suitable for temperatures between 0°C and - 40°C. Assembly of a typical walk-in-cooler takes about minimal man hours only. Non-standard sizes are available for specific requirements. 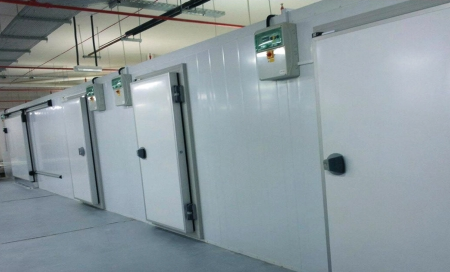 Our sandwich Panels provide economical, efficient and hygienic way of storing perishables.